Last Sunday the master bought about 10 pounds of sour cherries from our local grocery store. As excited as I was, I knew I had little time to do much with them. I was waiting for these sour cherries for weeks now, and they finally found their way to our home. Except the fact that I had to leave for business trip the next day. So what I did was to make a sour cherry slab pie with them immediately. While watching the world cup finals game I pitted the sour cherries, and made the pie right after the game was over. Now I'll leave the recipe for the slab pie for some other day. Today I'm posting the recipe for a very famous and popular jam. 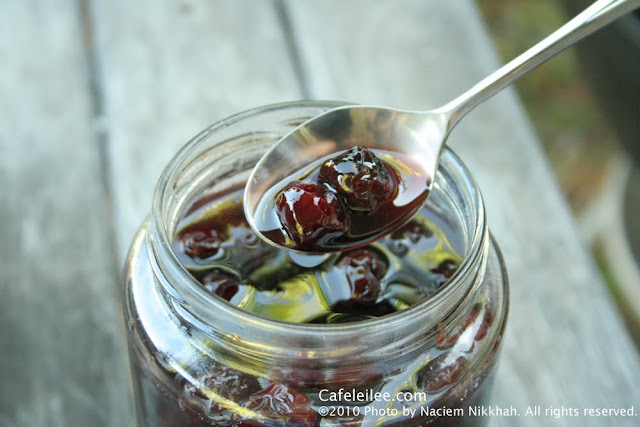 Sour cherry jam is one of the most popular jams in Iran. Their use is not limited to your regular bread and butter brunch. You can use the extra syrup from the jam to make a nice and refreshing sherbet, or make sour cherry rice with them. The recipes for all these dishes will be posted in the near future, which is the reason why I decided to post the recipe for the sour cherry jam today instead of the slab pie. 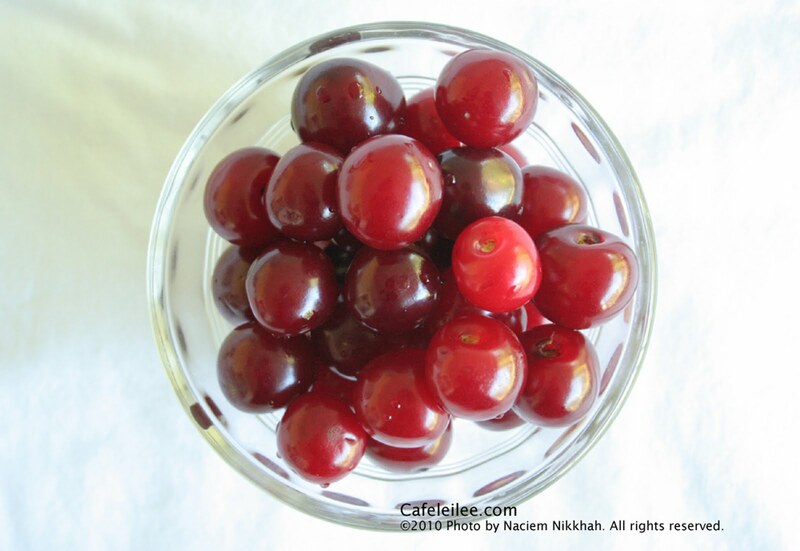 Wash the sour cherries, and discard the stems. With the tip of a toothpick or using a cherry pitter remove the pits. Place the sour cherries and sugar in a saucepan and let it sit for 2 to 3 hours in room temperature until sour cherries give out their juice. Place the saucepan over high heat until it comes to a boil. Add the mint and reduce the heat to a simmer. Let it simmer for about 1 hour until it reaches a syrupy consistency. Remove from the heat and let it cool. Discard the mint and store in clean jars. هفته پیش یک شنبه کد بانو حدود ۵ کیلو آلبالو خرید. با اینکه چند هفته بود که منتظر آلبالو بودم میدونستم که وقت زیادی ندارم. روز بعد باید مسافرت کاری میرفتم و وقت زیادی نداشتم. در حال تماشای آخرین بازی جام جهانی یک عالمه آلبالو هسته گرفتم و بعد از بازی باهاشون پای آلبالو درست کردم. حالا دستور پای آلبالو رو یک روز دیگه پست میکنم. امروز میخوام دستور مربا آلبالو رو پست کنم که جزو محبوبترین و معروفترین مربا های ما ایرانی هاست. با شیره مربا میشه شربت آلبالو درست کرد برای روزهای گرم تابستون و با خود مربا میشه آلبالو پلو خوشمزه پخت. دستور همه اینها رو در پستهای آینده خواهم نوشت. برای همین دارم الان دستور مربا رو پست میکنم. آلبالو ها را میشویم، دم های آلبالو را میگیریم و با نوک خلال دندان یا هسته گیر هسته آلبالو را در میاوریم. آلبالو های آمده شده را داخل قابلمه لعابی مناسبی میریزیم و لابلای آن شکر میپاشیم و می گذاریم آلبالو چند ساعت بماند و کامی آب بیاندازد، بعد ظرف را روی آتش تند میگذریم تا جوش بیاید. حرارت را کم میکنیم تا مربا کم کم بجوشد و نعناع را اضافه میکنیم. میگذریم شربت حدود ۱ ساعت کم کم بجوشد تا قوام بیاید. مربا را از روی آتش بر میداریم و میگذریم تا خنک شود. نعناع را از مربا در میاوریم و مربا را در شیشه های تمیز میریزیم.